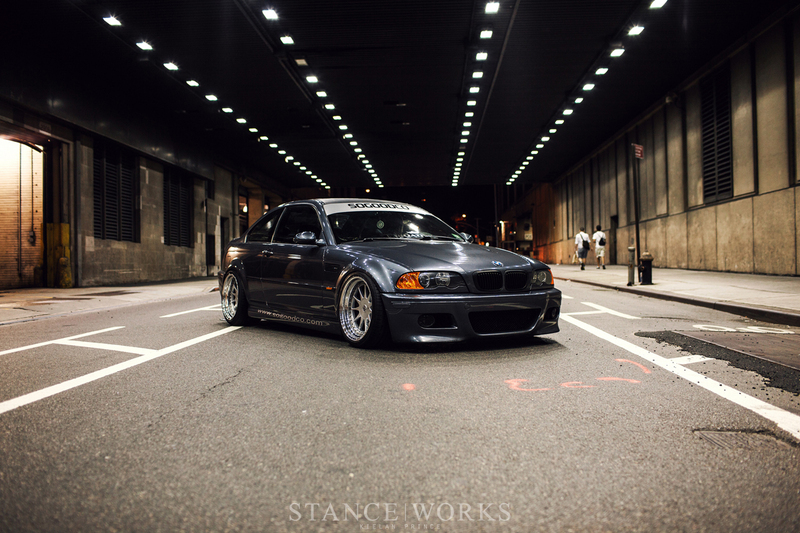 It was nearly four months ago when Kielan Prince approached Eric about shooting his M3 - a standard affair. Pick a time and place, get together, and shoot some photos. After an hour, maybe two, Kielan would presumably wrap things up and head home to begin his editing process, and before we know it, the rest of the world is able to enjoy some beautiful photography of a beautiful car. At least, that's how things typically go; Kielan and Eric had something else in mind for once. The two wanted a challenge; a photo set that pushed Kielan to his limits and gave Eric some photography he wouldn't forget. 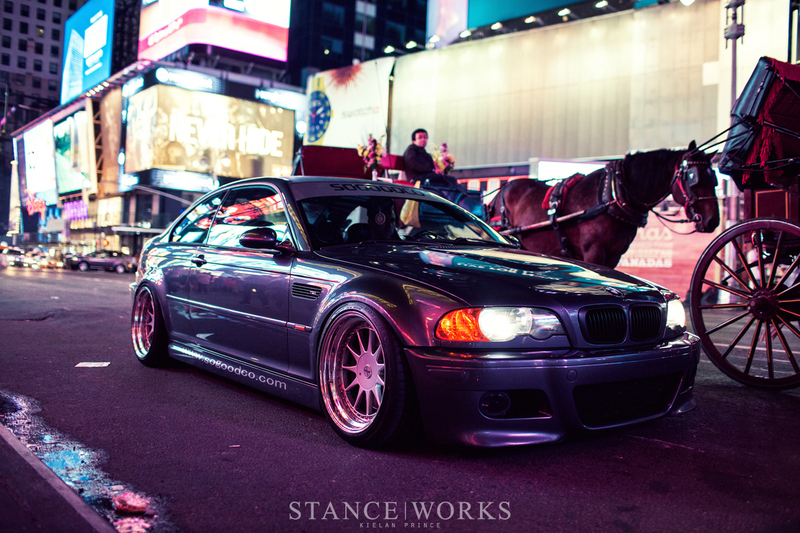 What better way than to take to the streets of downtown Manhattan? I can't speak for everyone, but I know that for me, a standard photo session receives little more planning than what goes into planning lunch on any given day. Andrew and I batt around a few location ideas, often less than an hour before we've told the respective car owner to meet us (thanks Google Maps), and once we've pinned something down, we do our best to make it work. Photo permits are few and far between - my father has always said that it's far better to beg for forgiveness than it is to ask for permission. We shoot off the cuff, fourty-nine times out of fifty. Kielan and Eric, on the other hand, took an entirely different approach. Two months before the two took camera to car, they began the planning process. Manhattan offered its own set of obstacles, and if the two wanted to cover the city, it meant more than just agreeing on a location and doing their best. Instead, the two scouted locations for months in advance. "We had to make sure that we would have time to stop the car, wherever it may be, and take photos without interruption," said Kielan. Interruption came from both ends - while the two didn't want to be bothered by security or police, it was also crucial that they didn't further impede upon the flow of New York traffic, nor get slammed with the infamously high NYC parking ticket costs. Because both of them worked within the city, the two often scouted separately, sending cell-phone photos back and forth of location ideas and making note of the ones that seemed best suited for their vision. Other times, the two would scout together, scouring the financial district for nooks and crannies, ins and outs - searching for the perfect place. "The next step was to make sure that we had all the right people present to make sure that this would go as seamlessly as possible." Of course the two weren't planning on shooting a production film, but nonetheless, they didn't want silly hiccups intervening with what was intended to be a spectacular night of photos, videos, and friends. Knowing they'd need an SUV of sorts to ensure they could get all of the appropriate angles for rolling shots, as well as having a smooth ride for long shutter drags, they called in the help of some friends. It was hit or miss, depending on your outlook - an X5M and an E30 convertible were sourced. Good enough, I suppose. After two months of off-and-on planning - making sure that all of the equipment was present, the support vehicles were ready, and a date was set. 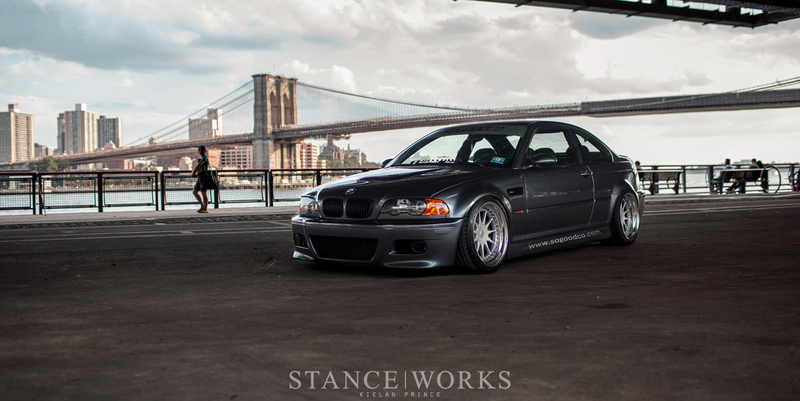 The two hit the streets on a Saturday morning underneath the Manhattan Bridge, immediately next to the renowned skate park. 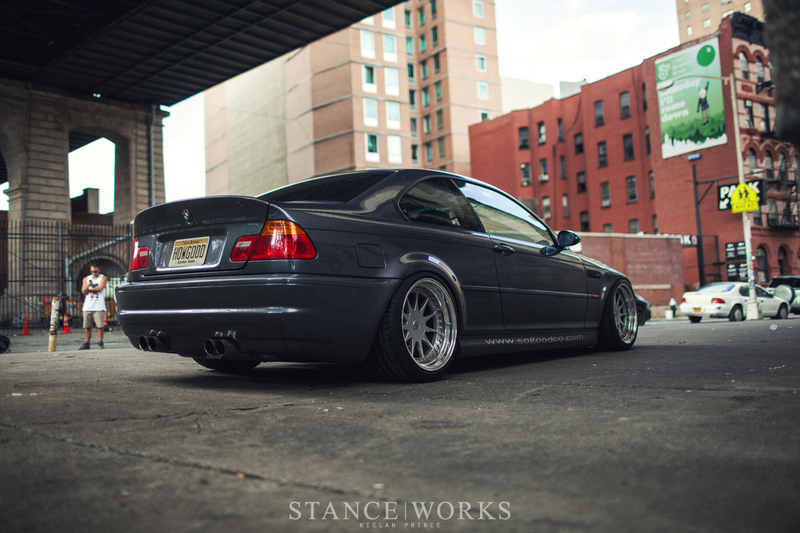 Their planning was put to use immediately: getting the car up and into the area without drawing attention to themselves, especially in Eric's M3, proved to be a challenge. After some very careful maneuvering up onto the sidewalk and to their desired location, they began shooting, knowing that their time was limited before they were inevitably removed from the area. After a few quick laps around the car, they moved further on to the sidewalk, hoping more and more that a cross security guard wouldn't start pestering them. Kielan worked his way around the car once more. Once he was done, everyone pulled together, and like a cat stuck in a tree, the group helped the slammed M3 climb safely down from the sidewalk. The two moved on to the next location, one that Kielan establishes as the most iconic place he's ever had the opportunity to shoot. The Brooklyn and Manhattan bridges stretched across the backdrop with FDR drive looming above - it was quintessentially New York. The risk of this particular location was high, as the car was parked in a pedestrian-only area, with no permits nor approval. 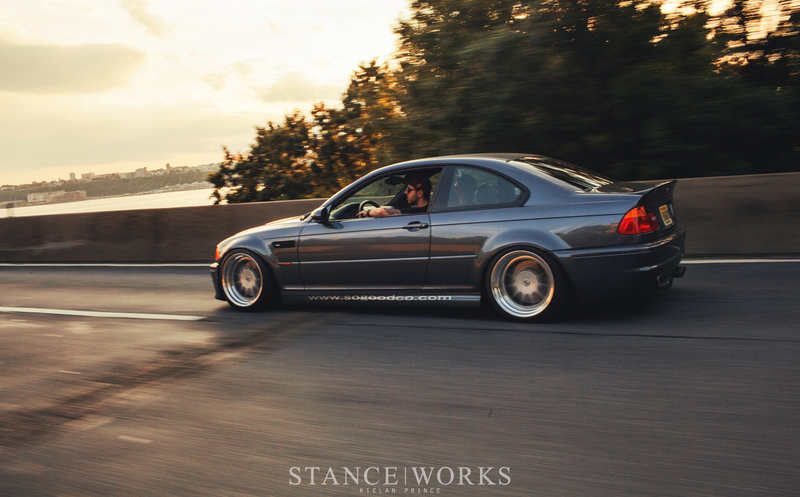 However, just minutes later, they moved once again, on to the rolling shots. "There is something quite freeing about standing up in the back of an E30 convertible while driving down the West Side Highway." Next, they set off for Midtown to grab some shots in traffic on 5th Avenue. As Kielan maneuvered around the car, pedestrians interfered constantly. 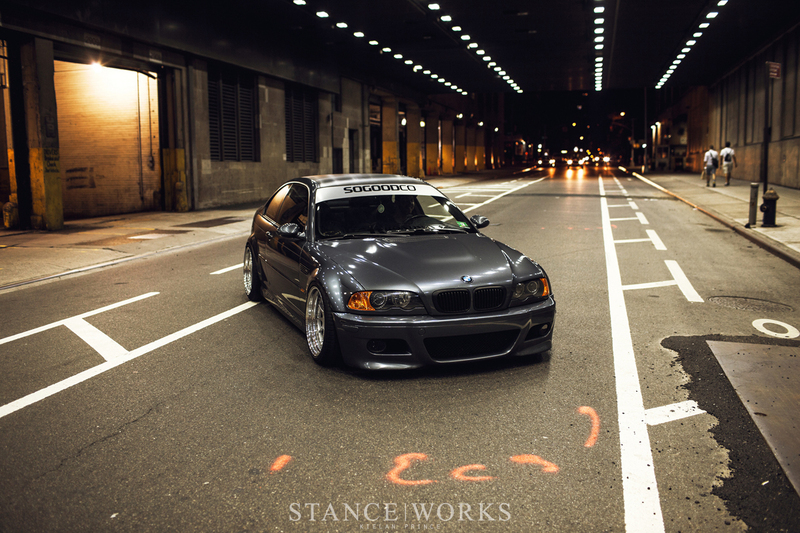 "As we were running down the sidewalk trying to get every photo opportunity we could, casual pedestrians were more than intrigued to find out “who is in that M3?” It made shooting much more difficult than originally anticipated." By 9:30, the crew was off to go shoot in one last location for the day. This time, the lights under the bridge next to the postal distribution center served as the stage. The speckled lighting dotted the paint - no strobes were needed. As expected, it wasn't long before the police arrived and insisted the boys move along. Apparently it's not alright to stop in the middle of the street, photos or not. "With that said we called it a day, packed up, and Eric and I made plans to meet up one last time. We needed to hit this last location, it would not be a shoot in New York City without it," said Kielan. A few weeks later, the guys met once more to shoot in Times Square. 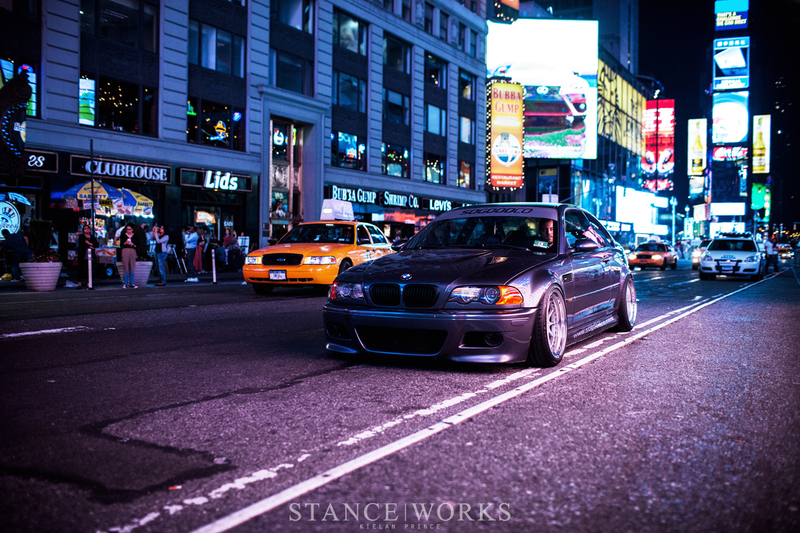 "I’ve been to Times Square more times than I care to even remember. For New Year’s Eve, for a number of Gumball rallies, and everything in between. But I had never shot a car there." Surprisingly, it was the smoothest location of the entire experience. After pulling up and parking the car, Kielan made sure to ask a cop if there'd be any issues. The officer assured that he wasn't going to write them a ticket, and he got to snapping. Down the street was the famous light flag, where the gang shot for more than half an hour, no questions asked. The yielded results are sure to remind both Eric and Kielan why they do what they do. 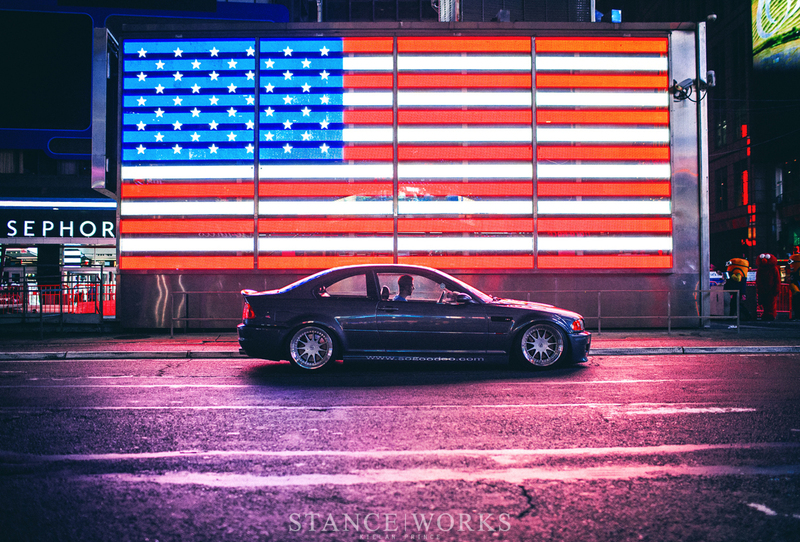 Eric's gorgeous M3 has been celebrated in a beautiful way, and Kielan pushed himself further than ever as a photographer. It was certainly an experience to remember, and entirely worth sharing. All I see in that last shot is Elmo (to the right) looking like, “Damn, that’s never been to Sesame Street.” Lol. This is an awesome right up. Kudos to the team, made some rad photos. 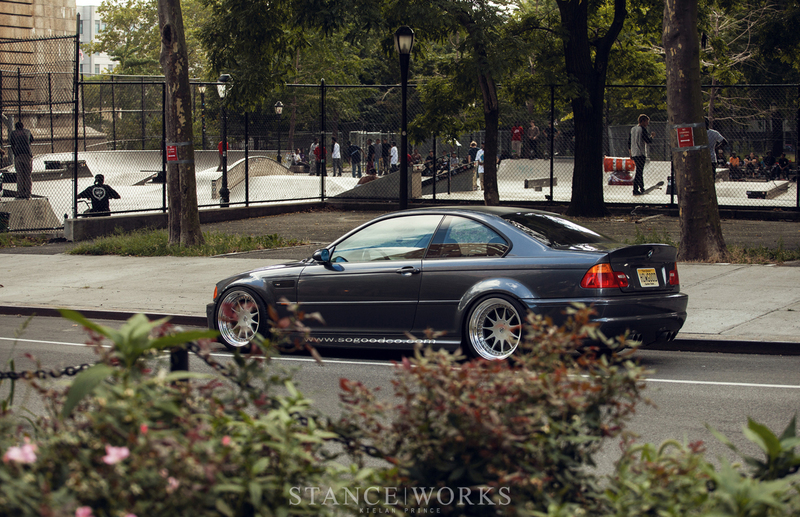 Love the varied locations, and the car sits just perfectly. The car is just too good, and Kielan Prince made an awesome work, once again. 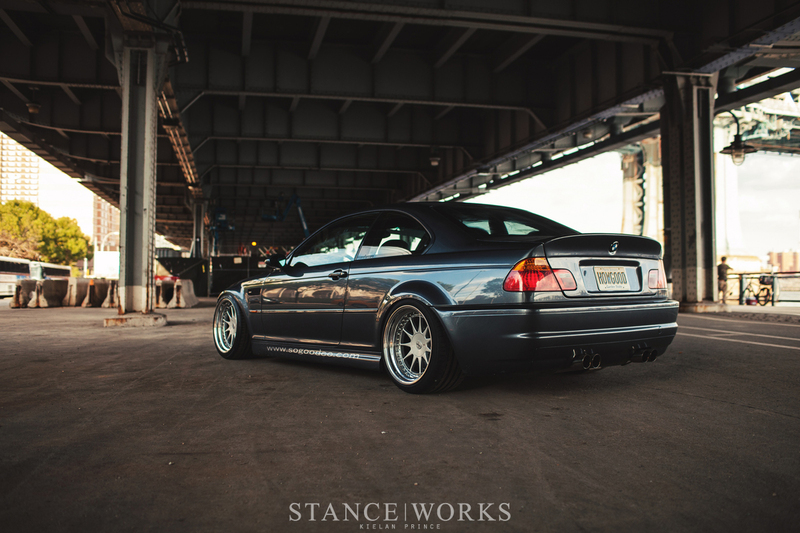 stanceworks always sets the perfect vibe for their pics….nailed another photo shoot again..good job.!!!! You got the url posted all over the car and the site don’t exist? @halftimber The company just broke up. Sadly some issues came up and they may or may not come back. At the time of the shoot it was doing well. Design C with custom barrels it looks like.